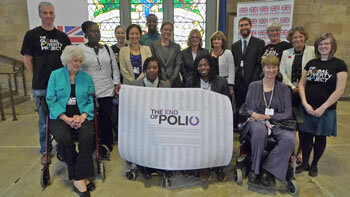 72 year old Sandra, a member of the British Polio Fellowship from Putney, met with Ex-Team GB Paralympians Ade Adepitan and Anne Wafula-Strike and charity campaigners from across the UK to meet with the new Secretary of State for International Development Justine Greening MP to show support for the Global Poverty Project’s End of Polio campaign today. Polio was eradicated in the UK in the 1980’s and since then has been reduced by 99% around the world, remaining only endemic in Afghanistan, Pakistan and Nigeria. Sandra, who herself has polio, met with the Secretary of State to thank the government for leading the way in supporting the eradication of polio around the world. However, with the UK’s financial commitment to fighting polio due to end this year, Sandra helped the paralympians and campaigners hand over a petition call the Government to continue their commitment to fighting this preventable disease which still disables children for life and according to reports, costs the global economy up to $50bn, making polio eradication a good value for money investment. Thousands of people across the UK have shown their support for The End of Polio campaign and the petition was handed over by the Global Poverty Project in conjunction with Results UK, Rotary International, the British Polio Fellowship and the British Pakistan Foundation and a number of supporters affected by polio, including members of the Secretary of States’ constituency. International Development Secretary, Justine Greening, said:"We have all been inspired by Paralympics GB this summer and it is great how they have teamed up with Global Poverty Project and Rotary International to lend their support to such a worthy cause. "Parents in this country no longer have to worry that their children will contract polio, which was eradicated in Britain many years ago. We are now on the verge of eradicating it across the world. Thanks to the UK's doubling of support, we helped to vaccinate 45 million children and halve the number of polio cases recorded last year. Walline voiced her support for global eradication, stressing the importance of acknowledging the education that still must be made within the UK. “I think one has to start first with GPs—many of them have never heard of [polio and Post Polio Syndrome], so that’s the first thing…. education is the biggest thing that has to happen, certainly with the general public,” Walline said.